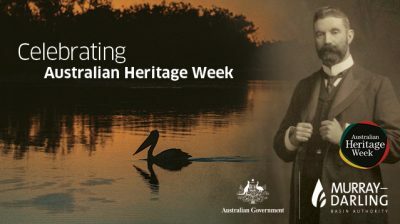 As part of Australian Heritage Week, the Murray–Darling Basin Authority (MDBA) is looking back on the diverse history of the Basin to understand how the nation developed and reflect on what makes the Murray–Darling Basin so special. Alfred Deakin, Australia’s second Prime Minister, is one of the most iconic and widely celebrated historical figures throughout the Basin. He is known as the Father of Irrigation after proving his commitment to nation building through the development of the irrigation industry in Australia during his time in power. Due to the lack of information on irrigation techniques available in Australia in the 1880s, Deakin travelled to America to gain an understanding of irrigation and water conservation strategies and how they could be implemented across the nation. While travelling through America, Alfred Deakin came across an irrigation model constructed by George and William Chaffey. He was so impressed with the design, he invited them back to Australia to explore the potential for irrigation along the River Murray system. The Chaffey’s helped develop the irrigation industry in Mildura, making it the agricultural hub it still is today. Throughout his travels, Deakin made the effort to write letters home detailing his experiences and new found knowledge. His sister, Catherine Deakin, was inspired by his travels and copied the letters into a diary so they could be archived and read from for years to come. To celebrate Australian Heritage week, the MDBA produced this interactive copy of Deakin’s letters.